Browse : Home Search Engine Will DuckDuckGo Be The Next Big Player In Search And Overtake Bing? 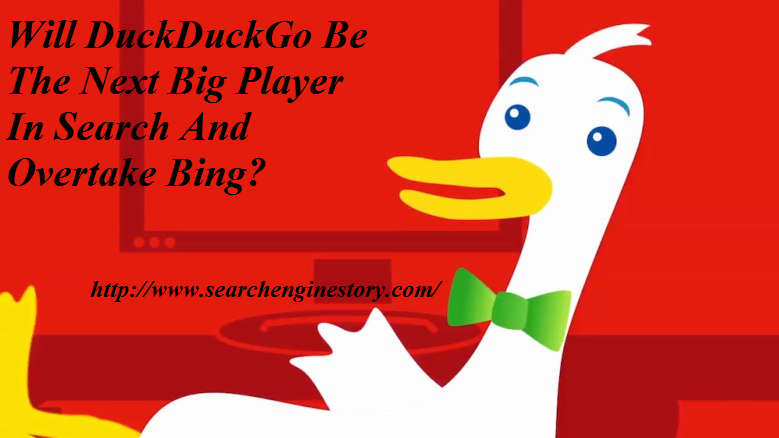 Will DuckDuckGo Be The Next Big Player In Search And Overtake Bing? Recent reports suggest that amidst the growing concerns over privacy and a deal with Apple, DuckDuckGo has all the needed potential to become a major player in search engine. Within a few days, Apple will be launching its iOS8, which is the latest version of iPhone’s mobile operating system. But this will come with a twist as one of the new features in the operating system will be the user’s ability to select DuckDuckGo as iPhone’s default search engine. This is nothing but a search engine that focuses on smarter answers, real privacy and is less messy. So, here’s a discussion on this brand new search engine for iPhone named DuckDuckGo. DuckDuckGo is a search engine, pretty like Google but the only difference is that it depends less on a crawler and more on external sources like Wikipedia, Yelp and WolframAlpha in order to generate answers and recommended pages for your queries. DuckDuckGo ingests data from other sources and still ranks the search results using its proprietary algorithm that takes into account links, apparently even no-follow links since Wikipedia is used as an authority link, and as a strong ranking signal. Since it was introduced in 2008, DuckDuckGo has already been steadily increasing its audience by about a billion searches, but recently the decision to include it in the upcoming Apple operating system will offer the much-needed encouragement and boost. But what does our survey show? Predictions of the growth of DuckDuckGo – Will privacy concerns give a boost? Well, out of 521 respondents, only 7% say that they’ve heard of DuckDuckGo. Studies also revealed that 5% of respondents have tried DuckDuckGo, though only 1.34% of them are daily users and only 0.78% say that they use DuckDuckGo as their primary search engine. Surely, DuckDuckGo would like for everyone to use it as their search engine but their primary appeal to the users is that it can guarantee privacy to its users and majority of the online users are pretty much concerned about their online privacy. In fact, according to a survey, around 90% people have some level of concern about their online privacy. What most respondents don’t realize is that Google ad networks consist of the largest ad network in the United States of America as defined by all the unique visitors. 98% of respondents, who say that they’ve used Google for some search query, have effectively piped their search history directly onto an ad network. As a follow-up to some of their questions about the user’s privacy concerns, the surveyers were curious to know whether or not people would pay for it. While 83% of the respondents say that they wouldn’t pay any fee for this ad-free search engine, 12% say that they would pay only $5 a month. On the other hand, 76% wouldn’t pay for a search engine that doesn’t track them and 17% say they would up to $5 a month. At some point of time, it is true that the users would get rather irritated with having their online usage tracked and then they might start paying attention to the different privacy advantages of DuckDuckGo.